This method is similar to the first technique, which is sanding. The difference is that sanding removes more paint and wood, and can expose the raw wood. 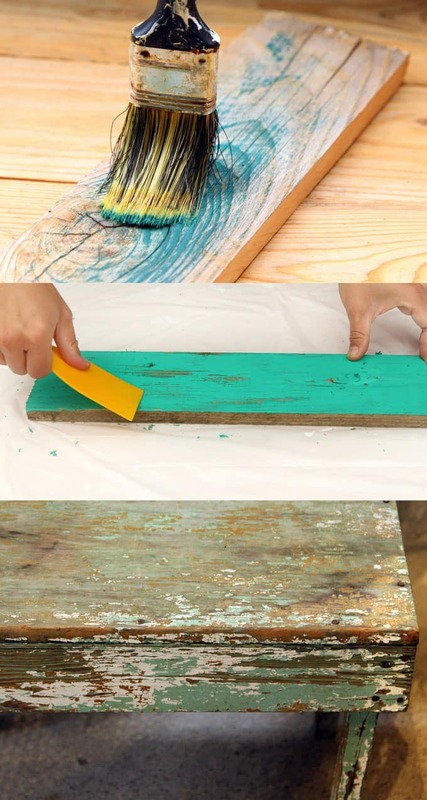 This technique will only remove some of the paint before it dries. I love this gently weathered wood look! First paint the wood. After the paint dries a few minutes and before the paint dries completely, take a scraper or credit card, and scrape off some paints at random spots. The beautiful green paint color is Decoart’s Outdoor Living Adirondack which you can get here. If you are painting furniture, those spots that naturally get bumped onto, such as corners and edges, would be the best places to have the chippy paint effect. The key is to scrape the paint when the paint has formed a “skin” but the surface is still a bit tacky to the touch. This technique to distress wood creates an elegant and soft aged wood look perfect for farmhouse style. It works best on pieces of raw wood. Both the Rinsing technique and Scraper technique (above) are removal techniques. 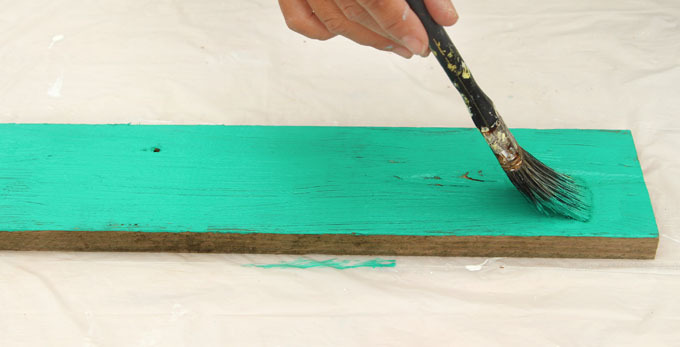 Start by painting the wood and letting the paint dry for a few minutes. 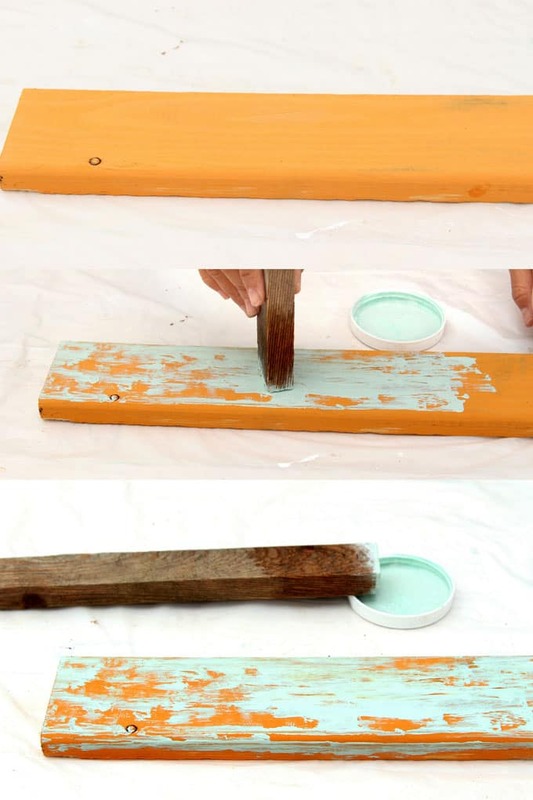 Before the paint dries completely, rinse the wood in water quickly while gently wiping the surface with a rag. The goal is to washed off some paint on the surface. I really like this piece- it looks like aged barn wood, doesn’t it? This is a one step method to distress wood or furniture using the help of a wooden block. It creates more of a chippy rustic look. Have you seen furniture and decor made from reclaimed boat wood? 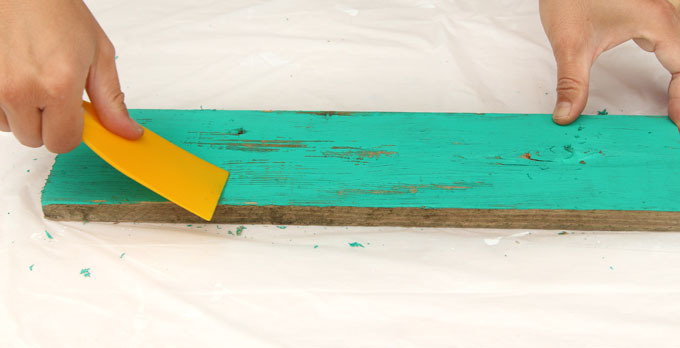 This is a great way to make your own “boat wood” that is so full of character! This is a one step method to distress wood and create a beautiful whitewashed barn wood look. It is great for wood with lots of textures on the surface. If the surface you are painting on has been finished with sealer, wax, or lacquer, it would be helpful to sand it a little so the new paint will adhere better. Don’t fear about messing up: you can always paint things over or sand spots to make it look better. And you can mix up these techniques! 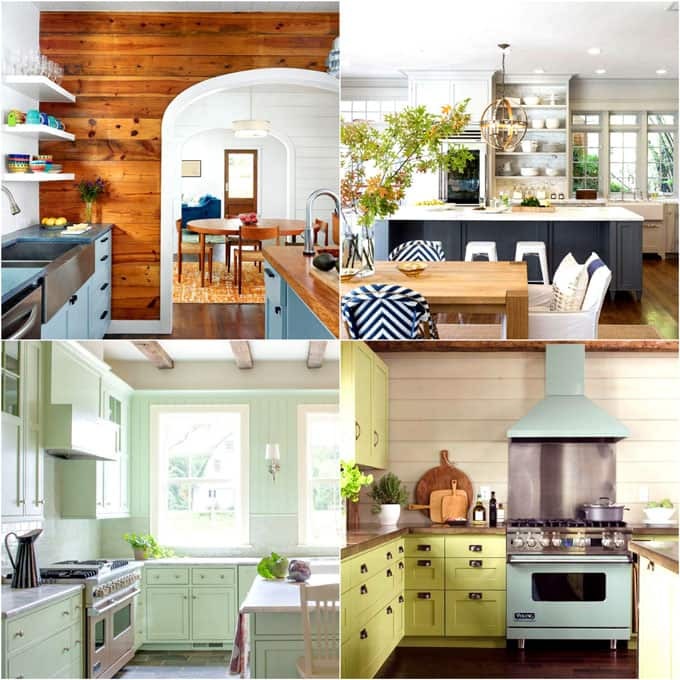 Since we are talking about painting, you may also love some color inspirations here: 25 beautiful kitchen cabinet paint color palettes! Happy painting! See you next week! This is a great, comprehensive list. Thanks! These are all great techniques. I just painted a sign for a thrift store redo and used a brush to lightly go over tacky craft glue. When it was dragged across, it gave the effects of knots from wood and it was completely unexpected! This is cool! I have been wanting to distress some old furniture exactly like this. I love the turquoise looking wood pieces you made! Love the distressed look. Now I just have to try it myself 🙂 I have been meaning to make some photography backgrounds so maybe one day this summer. These would make great back drops for my food photography! Pinning for later! looks like fun with great results. Great techniques with easy to follow instructions. Thanks so very much for sharing. 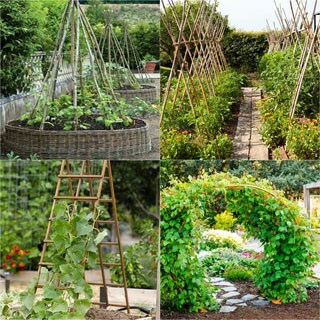 Thanks…this is a keeper…everything is one place with great instructions…love the photos. Thanks! Wo ist der Link um eine andere Sprache anzuklicken? Loved these techniques. Very interesting the way some were carried out. I will definitely try a couple of these. 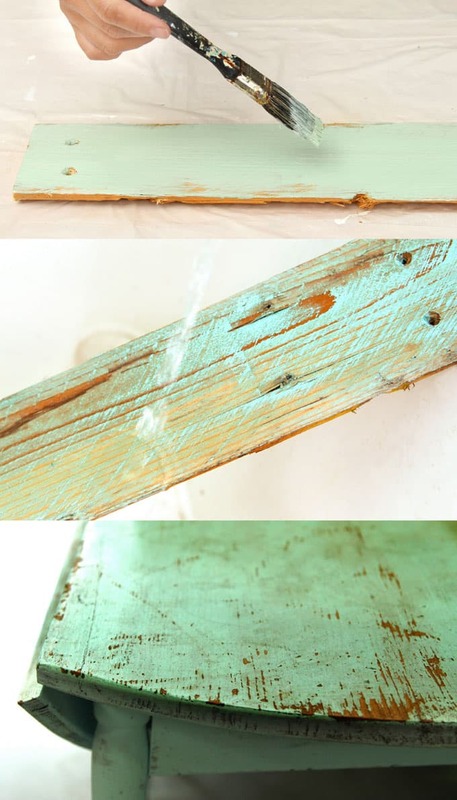 Hi Ananda, great tips on how to get the paint distressed look the easy way. 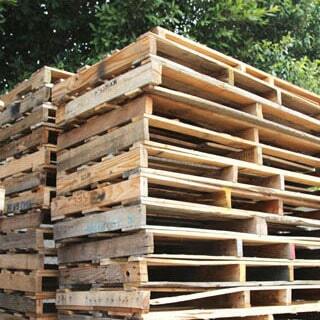 And I’m going to use them on a pallet shelf project I’ve started today. I love the whitewashed look! You are super talented! Here is a little trick I discovered for distressing wood, to give it a real antiqued effect. After you have lightly sanded the wood, but before you apply a new coat or finish, take a small piece of chain link, like for a padlock and chain, and hit the wood with it a few times in various spots to make some dents. THEN take a barbecue lighter and scorch the dent marks. But I have a question about tip with candles . It must be acrylics ? Thank you for sharing these techniques! I seem to have been making things more comp for icated than necessary and erred by letting mine dry completely. I was treating the pieces too gently while trying to distress them. Lol oxymoron, really. Refinishing pieces and giving them new life for modern homes is my fun time that I am trying to make enough with which to replace my income. There are soooo many truly gifted and creative people out there. Will these same techniques work with stains? hi james, the candle method should work. the only thing is that stains are thin and may seep under the resist materials.